Reigning junior Manx grand prix winner Wayne Kirwan is moving up to the Isle of Man TT races this year competing for the Crossan motorcycles team in the two supersport TT races on a Yamaha R6 supersport bike. For many years Wayne has been one of the most consistent riders at the Manx grand prix and for this year he will be aiming for more consistent results this time at the Isle of Man TT. The Crossan motorcycles team have run many a top rider over the years including Robert Dunlop, Michael Dunlop, Chris Palmer and in 2012 at the TT Dan Sayle. 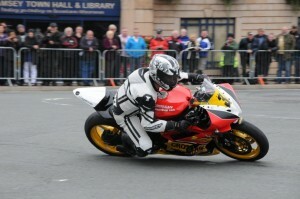 It will be the second season that Wayne Kirwan has raced for the Crossan motorcycles team and with the experience of competing for the team at the Manx grand prix in 2012 this year looks like being a Isle of Man TT that will bring top results and improved lap times around the mountain course for Wayne Kirwan.